This Iveco engine comes as a 13 litre, turbo charged, after cooled, 6 cylinder. These diesel units ensure clean rapid starting in all conditions with impressive performance and low operating costs. This diesel motor has been manufactured to comply with UL2200, EU and EPA emissions regulations. Iveco diesel motors are economic with durable operation at prime and standby duties required by the power generation industry. The DSE7310 is a control module for single gen-set applications. The module incorporates a number of advanced features to meet the most demanding on-site applications. The DSE7310 is an Automatic Start Control Module designed to start and stop diesel and gas generating sets that include electronic and non-electronic engines. The module includes USB, RS232 and RS485 ports as well as dedicated DSENet® terminals for expansion device connectivity. The modules are simple to operate and feature a simple menu layout for improved clarity. Enhanced features include a real time clock for enhanced event and performance monitoring, Ethernet communications for low cost monitoring, dual mutual standby to reduce engine wear and tear, and preventative maintenance features to detect engine part faults prior to a major problem occurring. The enclosures are fully powder coated to prevent rust and deterioration from weather elements. They also provide full sound insulation and are wind load certified for up to 180mph. Triton's sub-base diesel fuel tank has an integral steel dike intended to contain liquids from tank leak or rupture. The dike has integral protection on the top to prevent precipitation, debris or other elements from entering the diked area. Each closed top diked generator sub-base fuel tank is manufactured to comply with U.L 142 specifications. Custom designed trailers designed to specifications of generator by weights and sizes available for an additional fee. Known for its advanced engineering and technology, Iveco has become synonymous with high-performance diesel engines. 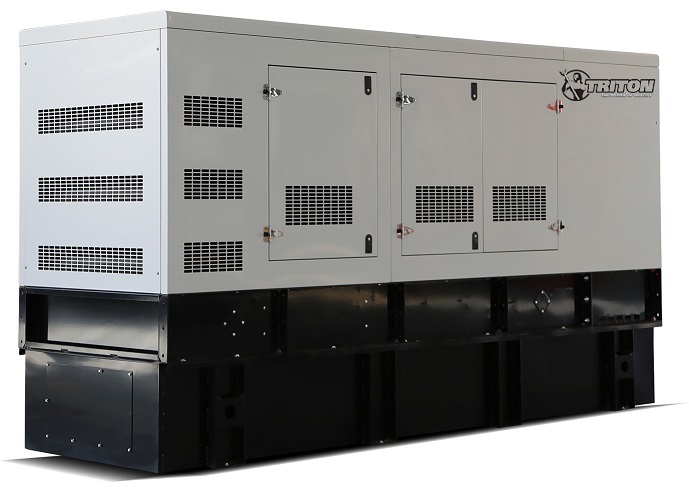 Businesses that call for backup power have trusted Triton diesel generators with their needs for several decades, and the present is no different. If you are interested in purchasing a generator with a Iveco diesel engine, contact one of our associates at 800-434-0003.